James Shore: Rabu Workflow: How Do We Get Customers to Participate? Rabu Workflow: How Do We Get Customers to Participate? 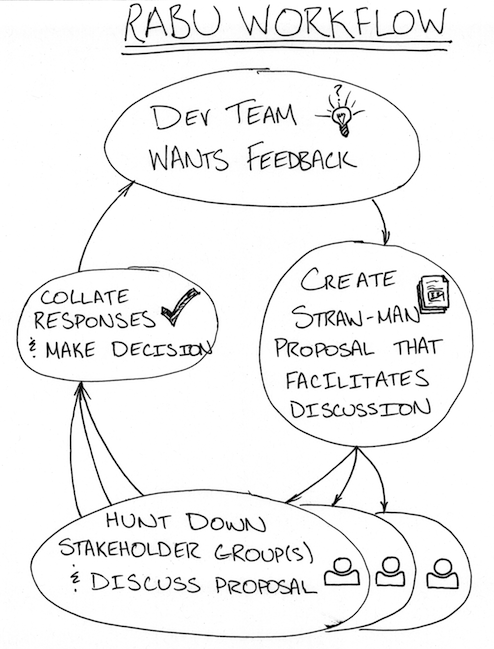 How do we get customers to participate in Agile development? An Agile team is supposed to be able to move full speed ahead at all times, making critical product decisions when they're needed without waiting for approval or clarifications. To achieve this, Agile teams are supposed to include full-time business experts who have the authority to make key business decisions. An established Agile team needs two business experts for every 3-6 programmers in order to keep moving quickly. Sufficient customer involvement is crucial to Agile success, but it almost never happens. For whatever reason, the people most qualified to be customers on an Agile team usually don't want to take that role. Instead, I typically see overworked product owners assigned part-time to multiple teams. They often have limited decision-making authority and relay questions to the real decision makers. Defects and delays result, and it's no fun for the product owners, either. Defects and delay. For many established Agile teams, the constraint isn't lack of programmers; it's lack of customers. What if we accepted this constraint as reality? Even on the very best Agile teams, you can't have all decision-makers on the team full-time. Yet we need to collaborate with stakeholders. We can't expect them all to join our team, but we need to continue making progress anyway. Rabu is oriented around this constraint. The core idea is that customers are much happier providing feedback on a proposal than writing on a blank slate. Look at it from their perspective: as a stakeholder, would you rather be put on the spot with an open-ended question like "what do you want," or would you rather critique a proposal? In the Rabu model, the Agile team makes all the decisions about their work. They have the most information and are most qualified to do so. When they need feedback, they create a proposal--that's where the Rabu tools can help--and ask for feedback in tightly-focused meetings. Sometimes different stakeholder groups will have conflicting reactions. The team's job is to collate those responses and make the decision that's in the best interests of the product. By putting decision-making responsibility back into the hands of the team, this workflow allows the team to keep making progress even when outside feedback is needed. Stakeholders are more willing to participate because their time is being used well. Most importantly, the Rabu workflow doesn't require any special dispensation from the organization. It's something that most teams can start doing today.